Now, I know that I have posted a LOT here, and that I have, um, distinctive (not to say eccentric) tastes, but — damn — it's a little scary when random strangers (Mojogeno in this case) on the internet can pinpoint my reaction with such accuracy! Don't you agree? Anyway, this dress (not Mojogeno's, by the way, but from seller Bebop-a-Diva) is B36 and has a starting bid of about $35 (but there is a reserve). I suppose I really don't have to worry until y'all can predict what I am having for breakfast (although, since pretty much every cold day I have the breakfast of champions — organic maple oatmeal and Diet Coke — that's not too hard)! 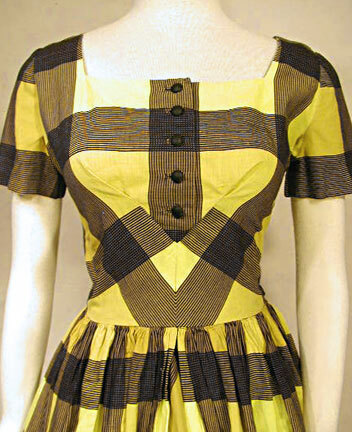 What a great dress, though I don’t wear yellow. I love, as I have loved in the past, the way that the waist visually pulls in. Wow! I like this! The use of the plaid is clever and figure enhancing. Too bad it’s too big for me! This dress is a marvel of design and construction. I am in love! Thanks, Erin, for your post today…I have placed a bid on it, but the reserve hasn’t been met. Stunning dress! I also love organic maple oatmeal and usually add raisins but when I ran out, tried some frozen peach slices. Yum! I gave up diet coke when my daughter had surgery for a bone cyst and the doc told her to give up soda as the phosphoric acid leaches calcium from the bones… as much as 50 percent. Also, nutrasweet is quite the poison. Check it out! Now here is the taste level that I love of yours. 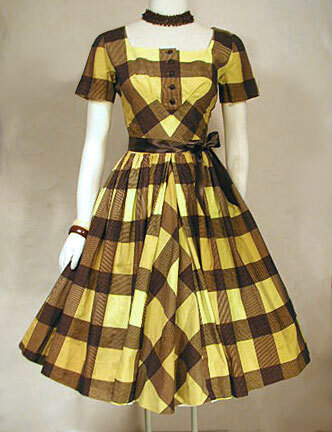 This dress is georgous and the use of the plaid is ery creative anf flatering all at the same time. Great dress. Its a couple inchs to big but I would love to by this dress, yet at the moment its the 1st of the month blues for me :(GREAT DRESS!!! I know I shouldn’t be drinking the Diet Coke, but hey, I don’t drink coffee and I need to get the caffeine somehow! When I’m being “healthy” I drink green tea or “Tang for grownups” — Emergen-C. I am totally weak for almost anything that uses plaid or stripes on the bias. If I had time – and a better dress form – I think I’d want to play around with draping to see if I could re-create that bodice. Simple yet brilliant. Well-spotted, Mojogeno! Jeeze, how beautiful and it’s exactly my measurements too. I can’t possibly justify buying it, even if I do love to swing dance, I just know I wouldn’t have the opportunity or guts to wear it out. Beautiful, though. well, i’m an art blogger, and i have to say, so far no one has sent me new artists to check out (or books about art or artists)… but i wouldn’t mind.great dress! and i have no comments about anyone’s diet (except for the Atkins’ diet — that one infuriates me!). What a stunning dress! And it’s my size! But yellow and brown separately make me look like death – can’t imagine what they’d do together. Now if it was some nice red, white, and blue like that striped Anthropologie dress. . . I am pretty certain about what colors look good on me. I’ve noticed, Erin, that you wear a whole range of colors with aplomb. Nice job! MMMmmmmmmm, Diet Coke! Fizzy chemically goodness! (Although I prefer mine separately, and not on top of my Honey Nut Cheerios. )I know that the chemical goodness is … not so much. However, until they find the Magic Diet that lets me Live Forever, I reckon something’s going to get me anyway, so I might as well have my yummy Diet Coke!And I swear that I’ve seen the pattern for this dress very, very recently; that Y-shaped dart is really distinctive. This dress is really tremendous! I’d love to have it in any plaid except yellow because I can’t wear yellow. Nonetheless, I do appreciate its yellowness, and as I always say, if you’re going to be yellow and black then be yellow and black! Oh gawd, belladonna, find it for us please! Wow. This is pretty…intense if you will. I wonder who made this? I would have never thought to put this style dress and this fabric print together. I think that’s what they call thinking outside the box :P.
I love the dress, it’s a little country and a little chic. I would definitely wear it! Your blog is fantastic, I just discovered it today and I’m putting it on my list of favorites. Well, I don’t see how there can be any more than one reaction to this dress — it’s manifestly fabulous! La Belladonna,PLEASE, please and PLEASE find that pattern!From time to time I become obsessed with a dress to the point of looking at the picture several times a day. This is one of those dresses! I adore it but wish to see how it’s made.Plaid and Yellow and Chocolate…yummy. Well Erin I did not mean to scare you, it is just after reading this wonderful blog daily I guess I start to see how your tastes run 😉 I LOVE the colors personally and feel the bust treatment is to-die-for, knew it had to be shared with you and your many readers. The print-matching (I don’t know if that’s the name for lining up the pattern so it looks so perfecto) is perfecto. I haven’t seen anything this precise outside a Savile Row suit, have you? Oh boy howdy is that lovely! :O I just died of happiness at such a dress. plIDQI Please write anything else!